Before we begin, I must beg your pardon. I've waited so very long to share this recipe with you that at this point, I fear you'll have some difficulty in obtaining the ingredients. But it would be a shame to have to wait until next winter to make this marmalade, so I'm going to post it anyway. I hope very much that, what with California often being on the leading edge of the change in the turnover of seasonal produce, the bright hues of winter citrus are still in abundance at your local markets. Personally, I've missed my window. I made only a small batch as a test run, and as it often does, life (*cough* grad school *cough*) kept me from making another, larger batch before kumquat season came to an end. Now that that one small batch is long gone, I find myself pining for it. 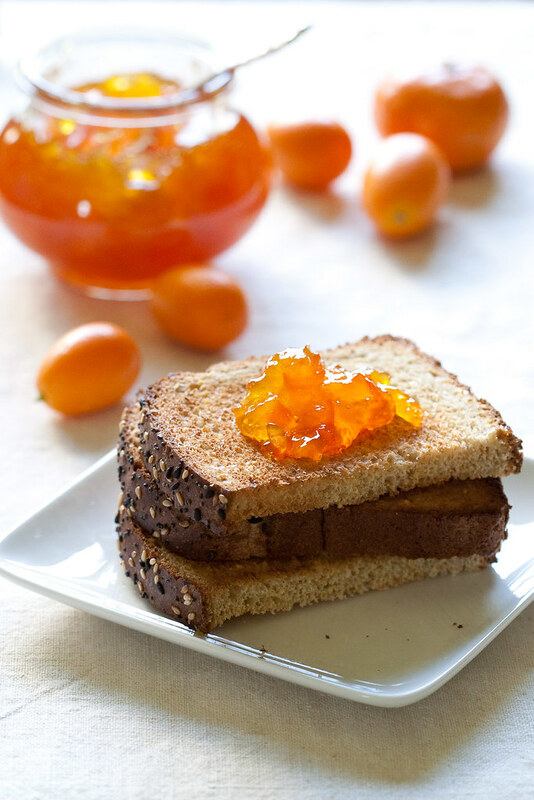 I still love orange marmalade, but after making and tasting tangerine-kumquat marmalade, I admit that I'm spooning ordinary orange marmalade onto my toast with a little less enthusiasm than I used to. 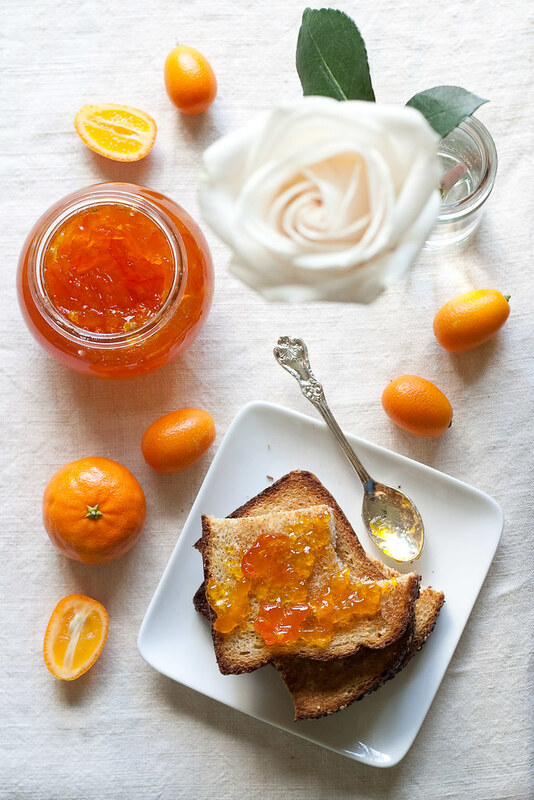 There might even be a sigh now and then as I remember that what I have left in my pantry for the next nine months or so is not, in fact, tangerine-kumquat marmalade. 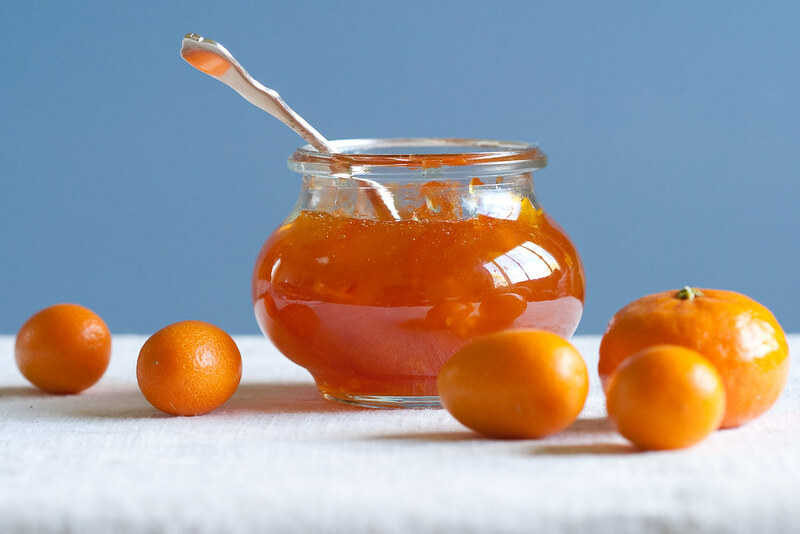 Most marmalades succeed reasonably well in striking a balance among sweet, tart, and bitter flavors. None, in my experience, does it with the grace that this one possesses. As Thomas Keller notes at the beginning of the recipe, this marmalade is at home aside an elegantly prepared duck as it is atop a humble bagel with cream cheese. Marmalade skeptics might look askance at the relatively large pieces of rind suspended in the jelly. Indeed, the marmalade does have a substantial (in my opinion, very pleasant) chew, but the rind's bitterness mellows with an overnight soak in water, so those large pieces are not as bold as they otherwise might be. In fact, other than the color, there's not much about this marmalade that is bold. But don't let that dissuade you. It doesn't need to be bold. It's perfectly content to wait, earnest and smiling, for you to discover its virtues in your own good time. And I'm sure you will--assuming you can find some kumquats. Put the kumquat pieces in a large bowl, and pour in enough cold water to cover by about 2 inches. Place the bowl in the refrigerator, and chill for at least 18 hours, or up to 24 hours. This soak and chill will temper the rind's bitterness. When you are ready to make the marmalade, quarter the tangerines and pour the juice from the cutting board into a 1-cup (or larger) measuring cup. Working with one quarter at a time, cut the tangerine flesh away from the skin (being careful not to cut into the pith). If you encounter any seeds, remove and discard them. li>Squeeze the tangerine juice into the measuring cup. Discard the rind, but reserve the juiced flesh. Continue until you have 1 cup of juice, then set the juice aside. Gather up the reserved tangerine flesh, chop it, and transfer it to a medium-sized pot. Add the kumquats, the juice, and the sugar, and stir to combine. Affix a candy thermometer to the side of the pot. Bring the mixture to a simmer and cook, skimming off as much foam as you can, until it registers 215-220F (100-105C) and a small amount dribbled onto a chilled plate sets nicely and wrinkles when pushed with your finger. Remove the pot from the heat. 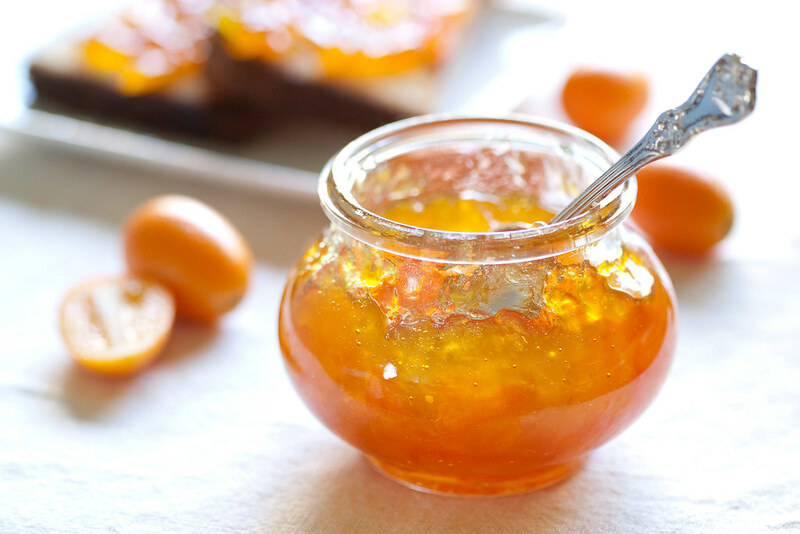 Ladle the marmalade into clean jars, cover, let cool to room temperature, and chill. The marmalade should be chilled for at least 2 hours, and ideally for 24 hours, before being served. The marmalade keeps, refrigerated, for 1 month--that is, if you can make it last that long. Alternatively, you can use the hot pack canning method for shelf-stable jars. Can we make mental notes to refer back to this one next year? I'm so intrigued. I missed the Seville orange season and I still feel cross about it! I'm hoping to do a berry-ish preserve post once the strawberries hit their stride! Bee, good idea. Perhaps I'll repost this one when citrus come back in season.